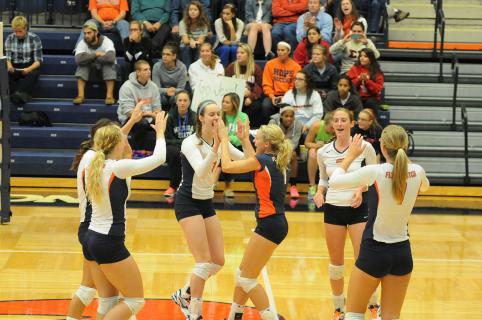 The Hope College volleyball team is ranked fifth in the American Volleyball Coaches Association (AVCA) Preseason NCAA Division III poll announced today. The Flying Dutch received 916 points to tie Christopher Newport (Va.) University for fifth place. Reigning Division III national champion St. Thomas (Minn.) University topped the rankings with 1,196 points and 47 first-place votes. St. Thomas — which won the national title at DeVos Fieldhouse — was followed in the poll by No. 2 Calvin College (last year’s runner-up), No. 3 Wittenberg (Ohio) University and No. 4 Elmhurst (Ill.) University. Christopher Newport received the other first-place vote. Hope is coming off a 29-5 season in which the Flying Dutch reached the 20-win mark for the eighth consecutive time and advanced to the second round of the national tournament in their fifth consecutive postseason appearance. Hope finished seventh in the final American Volleyball Coaches Association (AVCA) Division III poll. Coach Becky Schmidt's preseason roster of 26 features 13 returning letterwinners, including three seniors, six juniors and five sophomores, and 13 freshmen. The Flying Dutch return junior outside hitter Jenna Grasmeyer of Hudsonville (Unity Christian HS). She was a First Team AVCA Division III All-American and an All-MIAA First Teamer during the 2012 season. Grasmeyer is one of five All-Americans all-time from Hope. Senior middle hitter Mari Schoolmaster of Portage (Portage Central HS) also is back. She earned AVCA All-Region honors last season. Hope players report to campus on Monday. The Flying Dutch open the 2013 season on August 30-31 at Bluffton (Ohio) University’s Sommer Spiketacular. Hope’s home opener is September 3 at 6:30 p.m. against Alma College. The Flying Dutch are hosting the eight-team Division III national championships again this season. They are November 21-23 at DeVos Fieldhouse. Click here to see the entire AVCA Division III preseason poll.